There’s nothing like coming home to a peaceful sanctuary after a long day at work. Sometimes it could be a light and airy French Country bedroom, other times it’s a relaxing read out in the sunroom, but one of our favorite ways to wind down is a long, hot shower in a dreamy bathroom. Don’t forget the smaller and often neglected rooms in the home. Read our five tips below to learn how to make your bathroom beautiful. Enjoy! The bathtub is the obvious focal point of any bathroom, and the one you choose has a huge impact on the space. Choose a tub that’ll both make a statement and make sense for your design style. One of our favorites is the freestanding claw foot tub for a traditional and luxe feel due to all of the opulent carving and detailing. 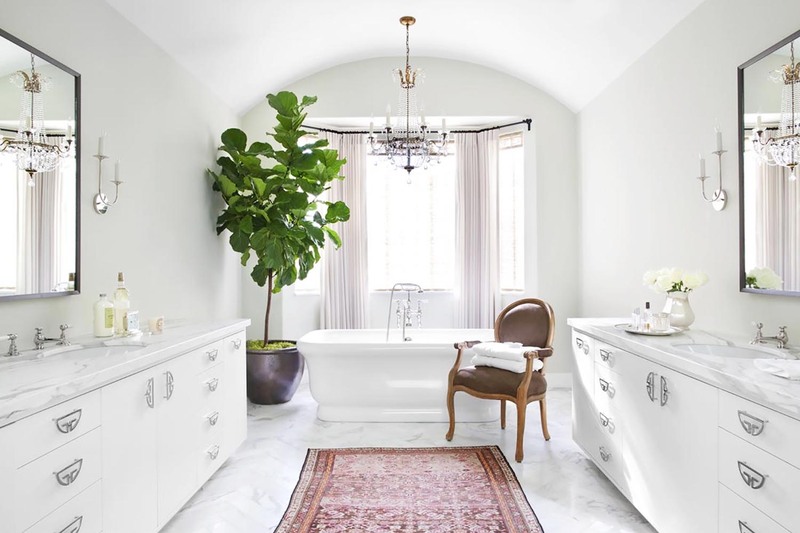 Pedestal tubs or platform tubs can also bring just as much of a wow factor, especially in a more modern space (and they’re typically less costly!). Whichever you choose, indulge a bit and opt for a soaking tub or whirlpool tub to make your baths even more relaxing! Lighting is absolutely critical in the bathroom: there are mirrors everywhere and you want your lighting to help maintain a relaxing, ethereal vibe. For your general ambiance lighting, use a chandelier, pendant, or ceiling-mounted light. Keep in mind that fluorescent bulbs casts a blue tint, and they can be very stark and dramatic in the bathroom while incandescent bulbs give an orange glow that are radiant and a touch more subdued (but they aren’t as bright). The most important lighting in the bathroom is near the mirror. If your bathroom allows for it, choose a pair of sconces for each side of the mirror and place them at eye level with a third light right above the mirror. This lighting arrangement illuminates your face from every side and eliminates shadows while you get ready and apply makeup. Here are the bare necessities for bathroom floors: they need to be durable, impervious to water, and slip-resistant. But to capture that dreamy bathroom aesthetic, they also need to be beautiful. The most luxurious choices are stone or ceramic tiles, and we’ve seen fun and colorful tile designs become increasingly popular in interiors over just this past year. For an added bonus, add in-floor radiant heating to take the chill off the floors for when you first step into the bathroom in the morning. Color is power. It can wake you up or calm you down, and overall, color is what evokes that calmness you want to feel in a light and airy bathroom. Remember that your palette is more than the wall color. Take into consideration the hues in your cabinetry and flooring to develop a well-thought color scheme. If you’re thinking about straying from neutral, blue is one of our favorite bathroom colors for a gentle and soothing look. In fact, learn more about why you should use blue in your home here. One of the easiest ways to elevate your bathroom is to update your plumbing fixtures. To the average eye they might go unnoticed, but plumbing fixtures are the jewelry of the bathroom: they can complete your look and add some drama to the mix. We love elaborate metallic fixtures. The bathroom is also a great place to mix metals and incorporate mirrored finishes.